Trump’s Zero-Tariff Proposal: Throwaway Line or Serious Offer? At the risk of understatement, I’ve been very critical of President Trump’s trade policy. I pointed out that he was just as bad as Bernie Sanders before the election. And I didn’t change my tune once he got to the White House. I’ve written several columns bemoaning his protectionist approach, including a piece just two days ago where I criticized the President for blowing up the G7 summit for the wrong reason. That being said, he put forth a very attractive proposal in his post-G7 press conference. President Donald Trump told foreign leaders at the Group of Seven summit that they must dramatically reduce trade barriers with the United States… Trump, in a news conference before leaving for Singapore, described private conversations he held over two days with the leaders of Britain, France, Germany, Italy, Japan and Canada. He said he pushed them to consider removing every single tariff or trade barrier on American goods, and in return he would do the same for products from their countries. Part of me thinks this was just a throwaway line. But I’m always willing to look at the glass as being half-full. Here’s what I said when Dana Loesch asked me about Trump’s offer. Let’s treat Trump’s statement as a serious offer. Or as something that could evolve into a serious offer. And I’ll start by observing that mutual disarmament on trade among G7 countries would be good for America, especially from a Trump-ish perspective. 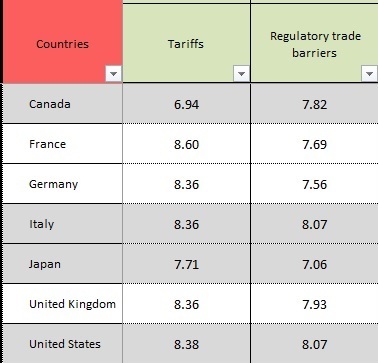 That’s because the U.S. currently is slightly better on trade according to the Fraser Institute’s measures of both tariff and non-tariff barriers, so other G7 countries would have to do more if we had complete trade liberalization. In reality, that simply means that those other countries have even more to gain if trade barriers disappear, but I’m trying to imagine how Trump would see things. 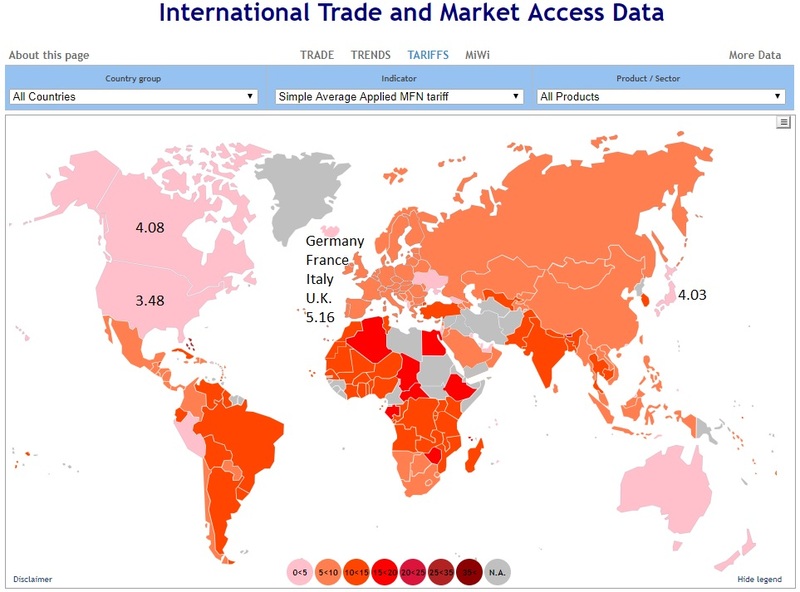 And here’s a map from the World Trade Organization, showing average MFN tariffs. The good news is that the United States is in the top category, with trade taxes that average only 3.48 percent. The other G7 nations also have relatively low tariffs, but not quite as low as the United States. So they would have to do more if there was an agreement, which presumably would appeal to Trump. Incidentally, my analysis assumes that the average tariff rates that apply generally also apply to trade between G7 nations. If that’s not the case, then I’ll have to go back to the drawing board since I very much doubt Trump can be convinced to support liberalization because of traditional free-market reasons. To be honest, I’m skeptical about Trump supporting free trade among G7 nations, regardless of how much liberalization other nations would be willing to embrace. The fundamental problem is that Trump genuinely seems to believe that a “trade deficit” is evidence that a nation is somehow losing or being mistreated. In reality, a trade deficit is simply the flip side of a capital surplus. And that’s generally evidence of a nation’s economic strength. So while I think it’s good news that Trump floated a zero-trade-barrier offer, I’m not holding my breath it will ever happen. P.S. Technically, a free trade agreement among the G7 isn’t even possible since Germany, France, Italy, and the United Kingdom (until Brexit is complete) are all part of the European Union, which is basically a single nation for purposes of trade rules. P.P.S. The nation of Georgia wins the prize for lowest average tariffs (1.51 percent) according to the WTO. New Zealand (2.04 percent), Peru (2.44 percent), and Australia (2.52 percent) also deserve praise for having very low taxes on trade. You can’t pay attention to what Trump says or does, everything is negotiation. We will only know his real position sometime later. Not entirely true: Australia is a net exporter of virtually all farm products, other foods, most raw materials, in particular coal, iron ore, bauxite, uranium, LNG etc. It is true that most manufactured products are imported, but, apart from the feckless years of Labor government 2001-13, it usually manages small trade surplus. But Australia’s low-to-non-existent tariff regime was not imposed by exogenous factors. It was a very conscious decision in the 70/80s to let the country sink or swim unprotected by tariffs that merely increased consumer costs and were a bureaucratic nightmare. is like talking about border walls without talking about visa overstays. Dan should recognize that Australia and New Zealand are net importers of EVERYTHING. If they place tariffs on anything (and they do, to some extent- on everything) they would essentially shut down their economy. So, giving them a gold star for that is rather silly.